MCT Coffee has taken the sporting world by storm. If you are looking for the following benefits, then grab yourself a jar today. Increase mental cognition. Get the clarity you are after. Reduction in appetite. When you burn energy and reduce your appetite, you have a very powerful combination. Take your personal performance to the next level. Feel the buzz and get more done in less time at the gym. 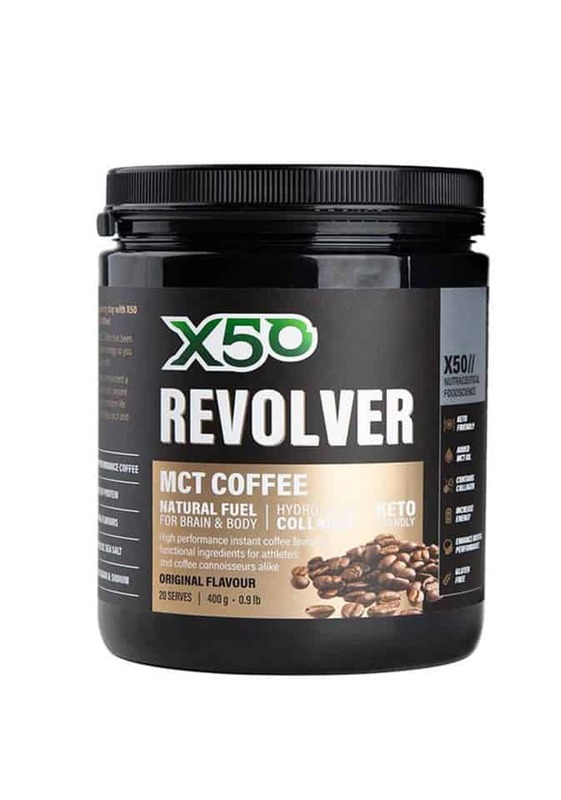 MCT Coffee or what we have called the X50 Revolver Coffee has taken performance enhancement to a whole new level. 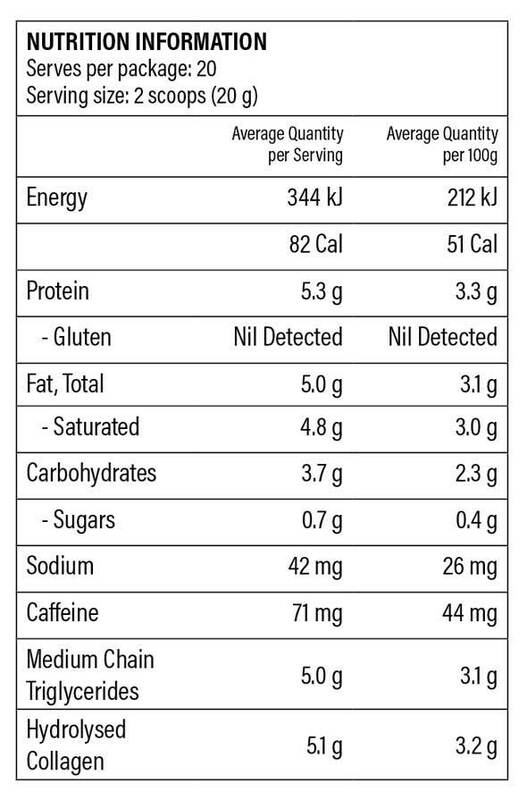 The three key benefits of MCT coffee are. 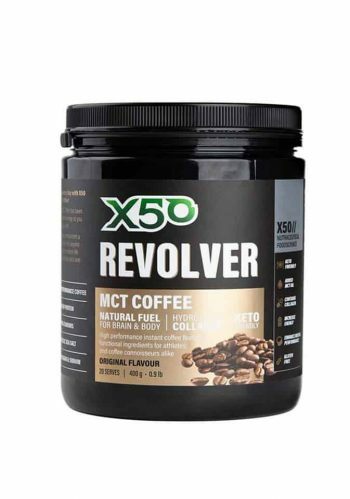 x50 Revolver is for both the time poor person and the coffee enthusiast. MCT Coffee by X50 provides high-quality instant coffee alongside a mix of protein and MCTs to offer you a complete performance enhancement. MCTs are efficient fatty acids that are readily available and used as fuel for consumption. Often being touted as a keto dieters best friend, while collagen has been shown to enhance tendon and joint repair when consumed before, during or after exercise. Don’t go into your next session without the right ammunition, use the X50 Revolver Coffee and blow away your competition. Or you can quietly hit new personal bests session after session. I mean, you want to get your squat, bench and deadlift weights up, right? MCTs are the main ingredient. MCTs are easily converted into ketones for readily available energy. They have also been shown to blunt hunger when used as a dietary supplement. Hydrolysed collagen may aid in supporting improved gut and connective tissue health. Supplementing with glycine/collagen prior to exercise has also been shown to directly support tendon and ligament restoration. Providing 71mg of naturally occurring caffeine per serve, coffee has been shown to enhance cognitive function. Also, coffee improves physical performance above almost all other naturally occurring supplements. Enhance mental performance, increase tissue regeneration and support a state of ketosis while still enjoying a delicious coffee. Why didn’t they think of this before now?